London, Sunday: Ravindra Jadeja marked his return to India duty by top-scoring with 86 not out as England’s James Anderson was kept waiting for a landmark wicket at the Oval on Sunday. 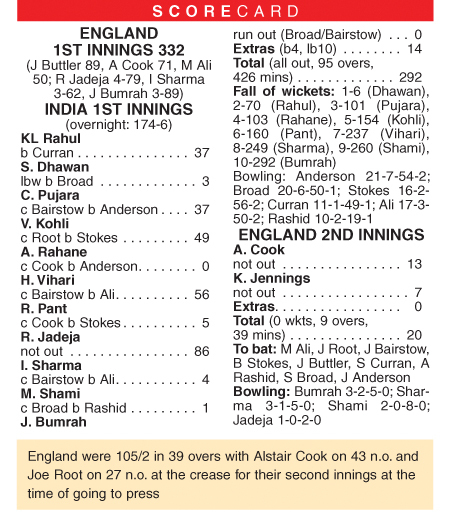 Jadeja also shared a seventh-wicket stand of 77 with Hanuma Vihari, who made 56 on debut, as India finished on 292 all out -- just 40 runs behind England’s first innings 332. England paceman Anderson took two for 54 in 21 overs to leave him two shy of Australia great Glenn McGrath’s record of 563 Test wickets, the most taken by any fast bowler. At tea, England were 20 without loss in their second innings, a lead of 60 runs in the last of a five-match series they had already won at 3-1 up. Alastair Cook, England’s all-time leading Test run-scorer, was 13 not out in his final innings before international retirement. Keaton Jennings, who had earlier dropped India No 11 Jasprit Bumrah first ball when Jadeja had made just 56, was unbeaten on seven. Before play started on Sunday, the International Cricket Council announced Anderson had been fined 15 percent of his match for “speaking in an aggressive manner” to umpire Kumar Dharmasena on Saturday after an lbw review against India captain Virat Kohli went the way of the star batsman. But Vihari, who came through a couple of close lbw incidents involving Broad when on nought, was increasingly assured as he completed an admirable fifty in 104 balls, including six fours and a six.